Earlier this month, New Horizons released a batch of absolutely breathtaking photos of Pluto at dusk, including the one above. In these images, particles in Pluto’s thin atmosphere are causing sunlight to scatter, revealing a complex, layered haze. Now, by studying that haze more closely, the New Horizons science team thinks it’s found yet another likeness between the distant dwarf world and our own: sunbeams. Pluto’s atmospheric haze — composed of nitrogen, methane, and complex hydrocarbons — is a mystery New Horizons researchers are just beginning to unpack. We’ve already identified at least a dozen distinct layers in the billowy atmosphere that extends up to 130 km (80 miles) above Pluto’s surface. As New Horizons researcher Alex Parker explains, once we unwrap the haze, we can see that it appears brighter in the evening sky than the morning sky, perhaps suggesting some sort of diurnal weather cycle. And there’s another feature that crops out prominently in the unwrapped images: bright traces, running inward along the planet’s edge well beyond the reach of the sun’s rays. These are sunbeams, produced when light hits particles in the atmosphere and scatters away between gaps in the dwarf world’s icy surface topography. In addition to being downright beautiful, sunbeams have another implication: they suggest the atmospheric haze extends right down to the surface, “similar to a low cloud deck or a fog bank,” Parker writes. There’s still so much to learn about this amazing little world, and there are plenty more images of Pluto’s skies to be downlinked and analyzed. 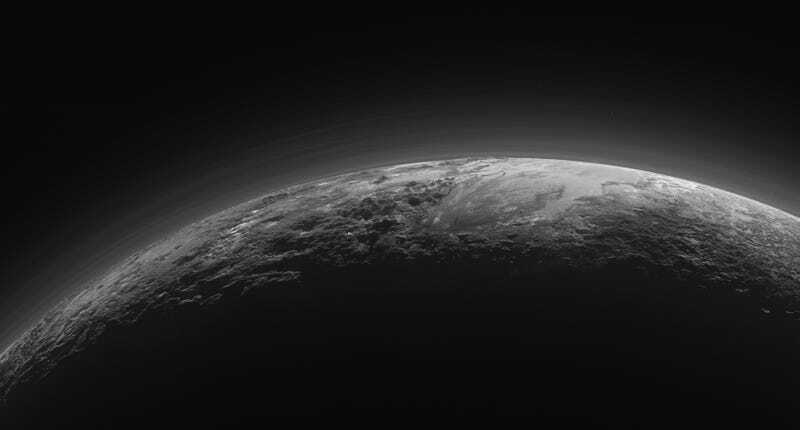 But between sunbeams and rolling banks of fog, Pluto, at 3 billion miles from home, is feeling closer than ever.